selection of furniture to suit entry level budgets, whilst providing an ideal solution for the busy office environment. 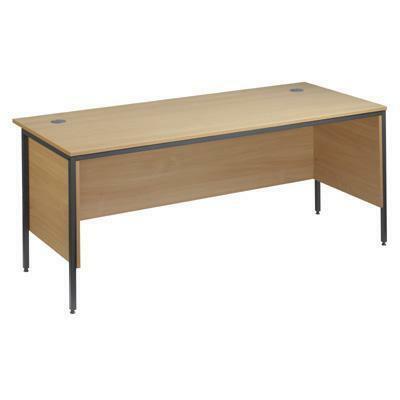 The Atlas range of desks has long been established as the entry level 18mm desking system for office furniture. Available in a range of styles and finishes with complementary primary and secondary storage. All MFC meets with British Standards 476 Class 1 Surface Spread of Flame as well as E1 European Standards on Formaldehyde Emissions. MFC board sourced from FSC Certified Suppliers. 18mm thick MFC desk top. 16 gauge "boxed section" profiled steel legs. 65mm diameter cable ports supplied with desk. Modesty panel, constructed from 18mm MFC, 500mm high. Foot leveller, adjustable to 20mm extension. H leg desk with cable access ports. Our fitters are available to help you assemble and install your purchase. Manufactur pn PLEASE CALL !! Ship wieght PLEASE CALL ! !